Alfred A. Knopf, New York, 2016. 319 pages. 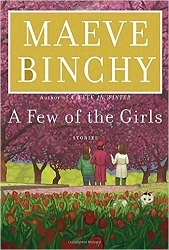 I do so love Maeve Binchy’s writing! This collection of short stories is classic Maeve Binchy. Her agent and editors selected many she had written over the years and collected them in this marvelous volume. There are thirty-six stories with a wide variety of viewpoints. Some leave me inspired and thinking good thoughts, more ready to cope with life. Others leave me laughing at a character who got a worthy comeuppance. All are so true — true to human nature, whether the good side or the bad side of human nature. All are also entertaining. I think my favorite was probably the woman who was dumped who met a woman who had also been dumped years ago and now spent her time repairing broken china, which remind her of broken hearts. …she would see also how fragile things could be put together again if you realized that this was possible. Rather than just putting them in the back of a cupboard and pretending that the break hadn’t happened at all. For insights on life and love, this is a wonderful collection, but it’s also good for spending time with “a few of the girls” who will feel like old friends. This entry was posted on Friday, April 15th, 2016 at 11:23 pm and is filed under Contemporary, Short Stories. You can follow any responses to this entry through the RSS 2.0 feed. You can leave a response, or trackback from your own site.